Saitama wreaks havoc aboard the alien ship and meets the commander, Boros, Dominator of the Universe. 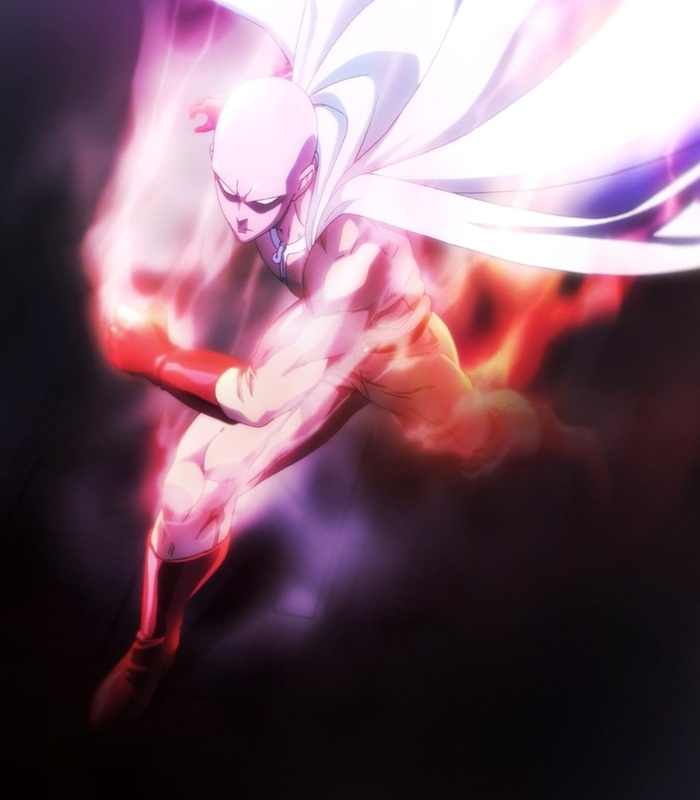 Episode 11 - "Dominator of the Universe"
If Saitama takes two punches to defeat someone, is he no longer One-Punch Man? Is he just One-Punch-Most-of-the-Time Man? Can we reconcile this tautological contradiction by just positing that he defeated Boros' armor in one punch? Let's go with that. What a great action packed show! The other heroes got their own hero moments while the one man wrecking crew Saitama would have taken less than 20 minutes to destroy the alien ship. The blue alien's running commentary was the best gauge of Saitama's progress. Saitama can be cunning! Enemy says go right, I'll go left! That never works in real life. Seeing the villains Saitama had defeated rehabilitated and in mundane situations really brought home the fact that we're almost to the end of the season. Well, Sonic wasn't rehabilitated. I liked how he made sure he had a "Nin-Nin" brand radio. Saitama looks like he has the run of the toy store. He's about to meet some (hopefully) strong bad guys. Ah, I guess not yet. Anybody can throw some rocks around, see? Yeah, but not everybody can one-shot the second strongest alien on the ship. Tatsumaki had her hero moment after the strong melee fighters proved their mettle against the quick regeneration guy. Their battle was pretty good, thanks to the observations of the sword fighter's protégé. Number 1, even if they have only physical attacks, they'll just keep going until it works out and Number 2, they aren't the types to listen to reason. They started winning because they kept fighting to their strengths until they found a solution: smash the dude's little marble power sources! I don't know if Silver Fang was really hurt that badly, but it was a nice development to ratchet up the tension in the fight. Naturally, it didn't even match up to the tension and expectation the audience wanted to see between the two final bosses. Energy without limits, that's what Boros saw in Saitama. One little dude destroyed 23% of the ship in 4 minutes! Gah! And then we had the speech where we discover the two foes are actually quite alike, even down to the seer who predicted their final showdown. Growing bored after getting so strong that there were no more challenging opponents. Doesn't ring a bell. 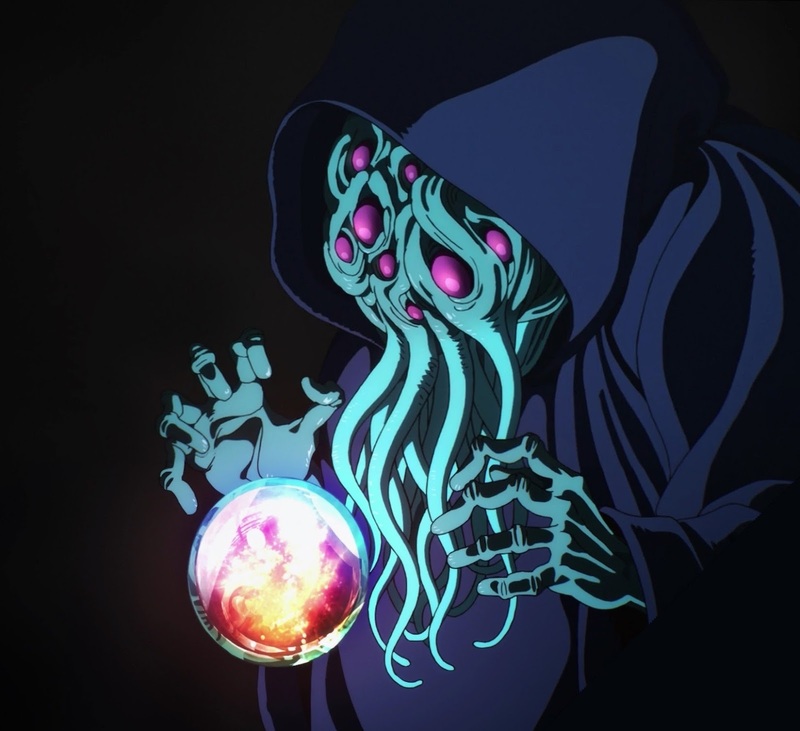 Of course, Earth's seer did not look like Cthulhu... Also, that origin story was way longer than 20 words. No wonder Saitama was irritated. Saitama's fist didn't defeat the bad guy in one shot! Uh oh. Saitama just defeated the suit of armor holding in Boros' power. Next time, the season finale. Will Saitama figure out he needs to destroy a certain crystal ball to defeat the Dominator of the Universe? Duh, of course he will!